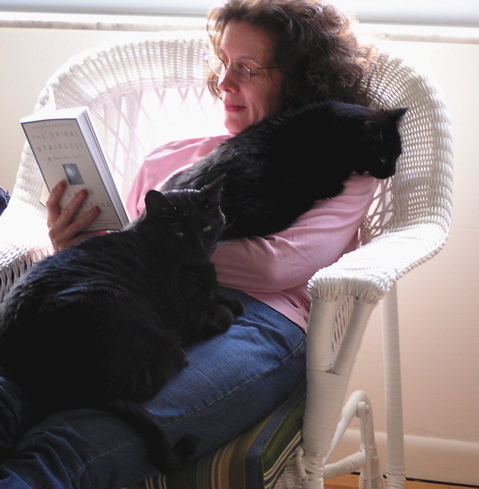 About Alane Starko: I am a professor, former elementary teacher, very amateur musician, beginning mosaicist, occasional storyteller, and multiple cat tender who is fascinated by creativity. In particular, I am interested in exploring ways teachers and parents can support and enhance creativity in the young people around us. I’ve written about these ideas in Creativity in the Classroom: Schools of Curious Delight and now in this blog I’m hoping to explore them with you. With luck, we can spur on our own creativity as well. Welcome! I’m Terry Hackett’s daughter, Sarah, recent treasure hunter of much on your blog. I do believe I could go through quite a heap of scrap paper and sticky notes in an hour with you and still not get enough ideas. Your students are so fortunate, whether they realize it now or in twenty years. I had the uncanny luck to fall into nothing but unusual jobs for the first 15 years (yikes, that sounds scary) of my teaching journey. I started out in a constructivist grass-roots school in San Diego County. This fall for the first time I’ll have a “normal” classroom placement. Fifth grade – my mind swirls with opportunities. Thanks for all of the links and food for thought on your blog! I’ll be digging in and setting up an entirely new environment in the coming weeks. Right now though, I’m packing for a week in Grand Teton and Yellowstone with 8 of my recent elementary graduates. I’ve worked with these kids for a few years, some since kindergarten. Now I get the joy of a week in outdoor education with them! Yep, that’s how summer vaca begins. 🙂 I do hope to cross paths with you someday. If you’re ever looking for a partnership with elementary/college students I’m a pretty willing guinea pig with a couple dozen lemmings in tow. I love your posts about creativity in the classroom! Would you consider writing a post for Teach Amazing? Sure. Why don’t you send me some hints about what you’d want? Really, anything will be great and of course I will link back to your blog. We get lots of visitors and I think this will be a hit! Thanks, Nichole. If you try anything, I’d love to hear about it. Comments make my day! I’m so pleased about your blog! This is Carol (Bowers) Engle – a former student at EMU. I think of you often, Alane. You were instrumental in my approach to education. Currently, I’m integrating ‘the arts’ into all areas of study. Fantastic results. Your work, around creativity in education, still inspires me!! How absolutely wonderful to hear from you, Carol! I’d love to hear more about what you are doing with the arts. I haven’t had a guest blogger in a while. Interested? Good Afternoon – Routledge recently sent me a copy of your 6th edition of Creativity in the Classroom and I am just now reading sections of immediate relevancy. I had reviewed a book proposal for them in another area of focus and opted to purchase a book in lieu of an honorarium. I picked your book. Honestly, I wish I would have started my career investigating how to enhance both “teaching with creativity” and “teaching for creativity.” To make a long story short, I plan to read your work diligently over the next few months as I look for how I can weave in your work among the courses I teach. Thank you for providing me with such a rich source of professional development. Thank you so much for your kind words. Even after all these years, when I send a book out into the world it is a wonder and a joy to me when I learn that people really read it! You made my day. My graduate students are reading your text next semester. I want them to write a blog and submit it to you as a quest blogger. How should they submit it to you? That would be great! The easiest thing to do probably would be to email materials to me at my work address: astarko@emich.edu.